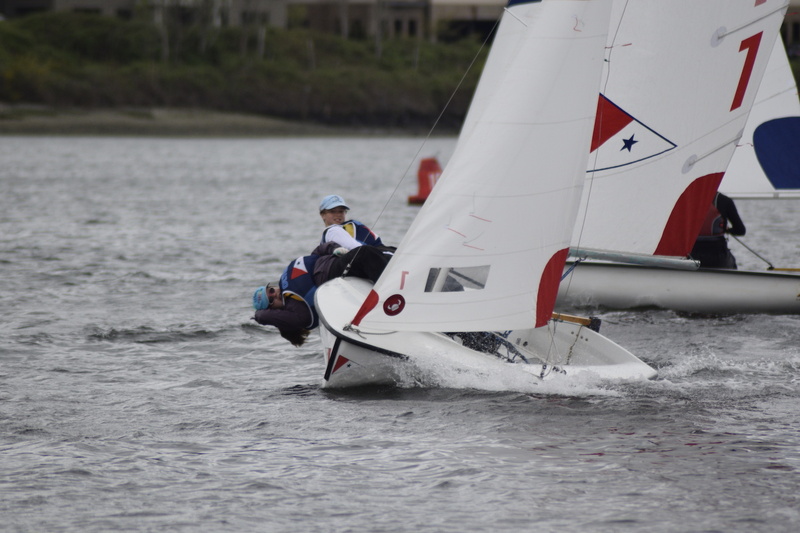 Lindsey Graham and Macy Bergford take full advantage of strong winds at the South Regional Team Race Regatta. Photo credit: Rebecca Connolly. Almost everywhere I go these days, the main topic of conversation is the weather. Just about every athlete, parent of an athlete, home gardener, event planner, landscaper, roofer, and utility worker, is grumbling about the wet and windy weather more than once this Spring. 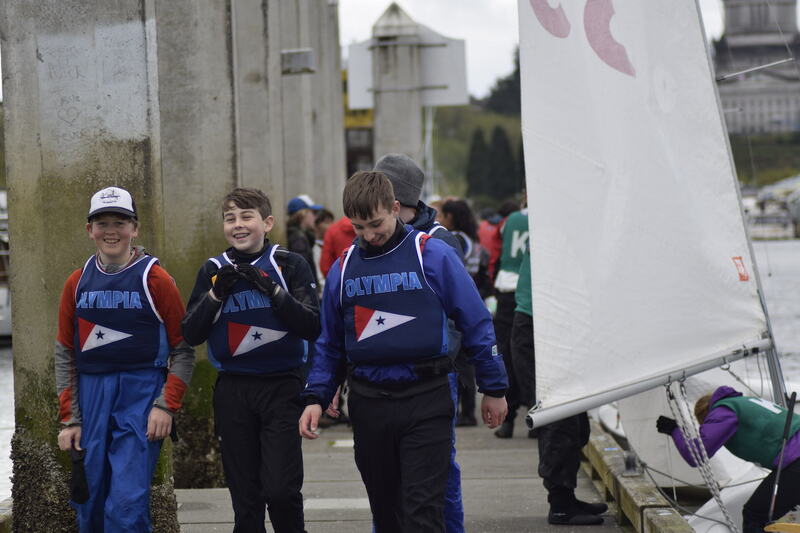 For the Olympia Yacht Club High School Sailing Team and the other teams competing in the South Regional Team Race on April 22, the gusty winds were a treat that made for a full day of fast and exciting races in front of Olympia’s Port Plaza. 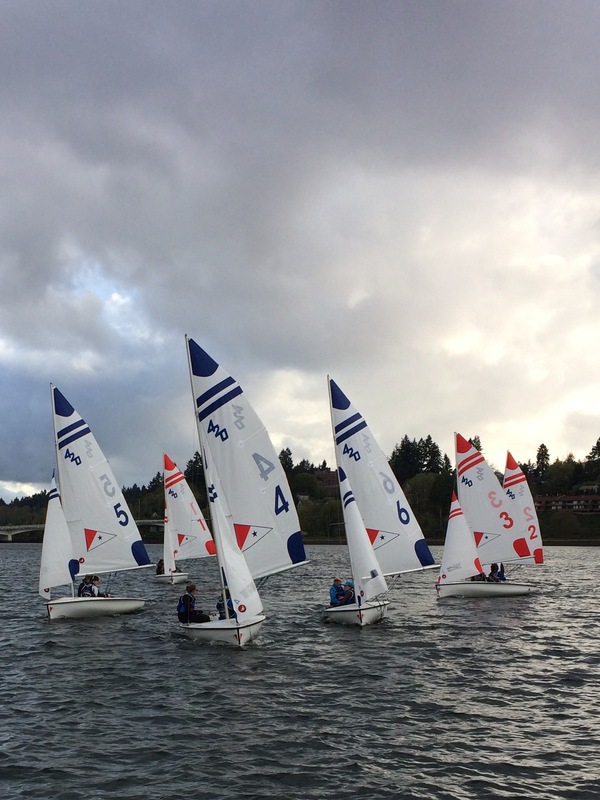 Dark clouds and steady winds made for great racing at the South Regional Team Race Regatta in Olympia. Photo credit: Rebecca Connolly. Team racing pits two teams of three boats against each other racing on a short course shaped like a capital letter ‘N’, where the combined team score determines the winner. In practices, teams work on plays and maneuvers they will use to pass opponents so they can finish first. Boats move like chess pieces, trying to take each other out, help a teammate or foul. The lowest scoring team in each race is the winner, with one point for first place, two points for second place, etc. 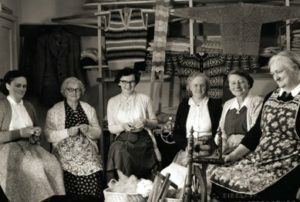 The best a team could finish is first, second and third for six points, but even first, second and sixth would win the race with nine points. Capital High School sailors Caroline Hurley and Annie Buelt successfully contend with steady wind at the South Regional Team Race Regatta. Photo credit: Rebecca Connolly. A stiff southwesterly wind was forecasted, and it did not disappoint. Winds peaked at 12-15 knots in the middle of the afternoon, and then slowed to a steady 8-10 knots for the remainder of the day. Hanavan noted that the racers were given an extra challenge when the city drained Capital Lake, creating a 3-5 knot current during the windiest part of the day. Races continued until almost 6:00 p.m., at which point the race committee decided to have a sail-off between the top five teams who were tied. In the end, Capital and Olympia High Schools tied for fourth, behind Charles Wright, Bainbridge High School and St. Mary’s from Oregon. Middle school sailors Hatcher Cox, Sam Bonauto and Joe Wiley have a good laugh after completing a race. Photo credit: Rebecca Connolly. The Olympia Yacht Club High School Sailing Team is comprised of sailors from Olympia, Capital, Tumwater, North Thurston and Avanti High Schools. 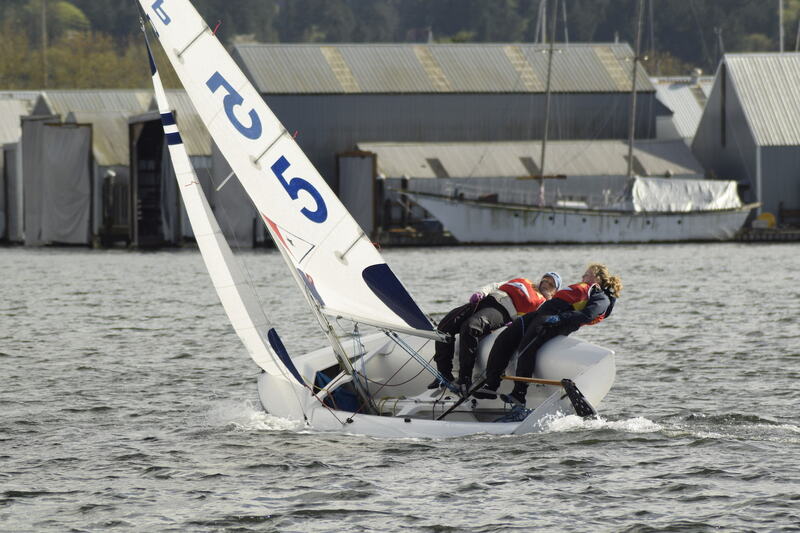 The teams practice together under Coach Hanavan at Olympia Yacht Club. Hanavan also coaches a middle school sailing team and is the Program Director for all of the youth sailing camps and lessons during the summer. For more information about high school sailing, please see the team’s website at www.oychighschoolsailingteam.com or contact the team by email at oychighschoolsailing@gmail.com.